BLACKSBURG, Va., May 10, 2010 – Robert Stephens, associate professor of history in the College of Liberal Arts and Human Sciences at Virginia Tech, received the university's 2010 Edward S. Diggs Teaching Scholars Award. Sponsored by the Diggs Endowed Professorship Fund and the Center for Instructional Development and Educational Research, the Diggs Teaching Scholars Award was established in 1992 and is presented annually to three Virginia Tech faculty members to recognize exceptional contributions to the teaching program and learning environment. A cash award is given to each recipient and their academic department. Diggs Teaching Scholars are invited to lead the Diggs Roundtable -- a series of presentations and a discussion of their innovative teaching -- a year after receiving the award. The award is supported by an endowed fund from an estate gift by the late Edward S. and Hattie Wilson Diggs. Mr. Diggs was a 1914 graduate of Virginia Tech. Students routinely praise Stephens' knowledge, enthusiasm, and commitment to helping them develop the critical reading and writing skills that are the stock and trade of historians. He also is committed to using technology and creating "hands-on" opportunities to learn history. His teaching acumen has been recognized with both a Certificate of Teaching Excellence and an XCaliber Award for Excellence in Technology Assisted Teaching and Learning. 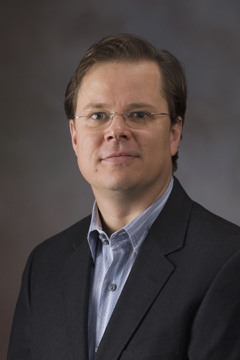 Stephens was among a team of faculty who created modules for the Digital History Reader, a multi-year project funded by the National Endowment for the Humanities. He also collaborated with colleagues Mark Barrow and Kathleen Jones on "the Book Project," where students enrolled in a senior seminar capstone course produce a polished, edited volume of essays which are then printed, cataloged, and placed in the library for other scholars to consult. A member of the Virginia Tech community since 2001, Stephens' scholarship focuses on the history of drugs, the history of film, and digital history. In addition to his appointment the Department of History, he serves as affiliated faculty with the Alliance for Social, Political, Ethical, and Cultural Thought, the Science and Technology Studies Program, and the program in film studies. Stephens received his bachelor's degree from the University of North Texas and a Ph.D. from the University of Texas.